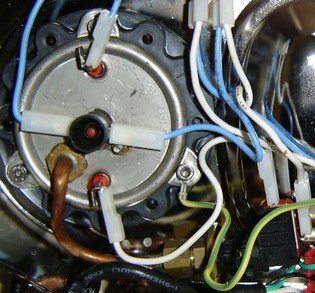 One inherent problem that the Pavoni style lever espresso machines is overheating. After a couple of shots the grouphead starts to overheat. 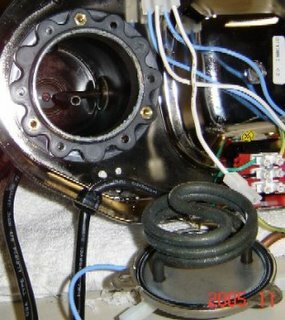 The only remedies would be turning off the machine and letting it cool down, some try wrapping the grouphead with a cold towel and others wash the portafilter in cold water to draw the heat out of the grouphead. Part of the problem was that there is no temperature control on this type of machine. While there is a pressurestat to regulate the temperature, making quick adjustments was impossible. 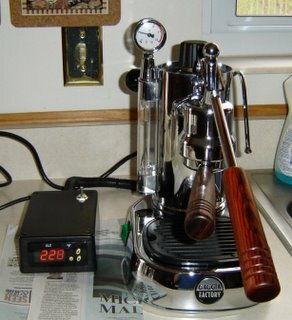 What you essentially have is a single boiler espresso machine that always operates in steam mode. So one day I thought to myself, why not add a PID controller so I can adjust the temperature. After a quick search for controllers my hopes were quickly dashed, I did not want to spend $150 for a controller. I did not need fuzzy logic or the tight band that a PID provided. 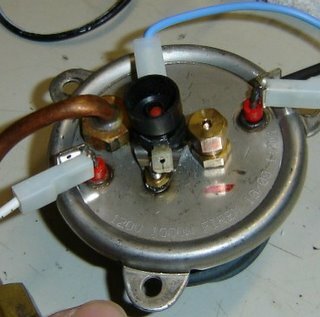 Then I say Jim’s post about a low cost thermocouple probed digital temperature controller. Using this low cost controller, I can set the temperature low for brewing and then raise it for steaming. The unit contains a 15 amp relay which is ample for the 1000W heating element the Factory uses. I started by removing the bottom of the machine. The assembly is very simple. You have a line that runs from the switch to a thermal breaker on the bottom of the boilerplate, then to one of the heating elements. Another line runs from the switch, to the pressurestat, then from the P-stat to the other heating element. So all I needed to do was remove the boilerplate, drill and tap the hole for the fitting, run the power line that goes to the Pstat to the controller and put it all back together. It is actually very simple. Removed the boilerplate. It is held on with 3 Allen screws, be careful not to break the rubber O-ring seal. 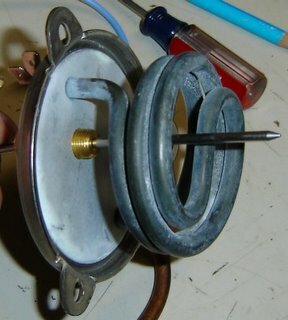 Drill and tap the plate but make sure your probe will be centered between the heater coils. I drilled a hole in the center rear of the machines base and inserted a rubber grommet. Mark the controller location on the project box and cut your mounting hole. I also drilled a hole in the rear center of the project box and installed another rubber grommet. I drilled a mounting hole on rear top of the project box to install a power switch for the controller. 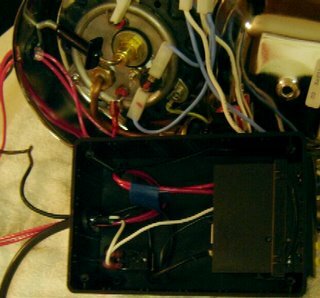 Run your wires from the espresso machine to the project box. Hook up you wires and mount the display. I used two small beads of hot glue to help secure the display to the back of the box. Then I put a bead of hot glue on the wires and grommet (inside the box) to act as a strain relief and likewise on the wires as the exit the espresso machines grommet. Sorry for the poor quality photo. 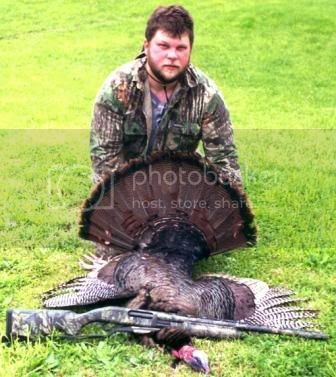 The strobe flash on my little digital camera burnt out. Then reassemble everything, fill the boiler and power it up. Set the temp low (say 190F) and let it heat. Then check the fittings for water leaks. If there are no leaks, up the temp and pressurize the boiler (say 225F, about .5 bar) and once again check for leaks. If all is good, then ramp the temp up to full pressure (245F, about 1 bar) and check for leaks. If there are no leaks, let the unit cool and put the bottom on the machine. Put the exposed wires in the split loom tubing and you are ready to go.